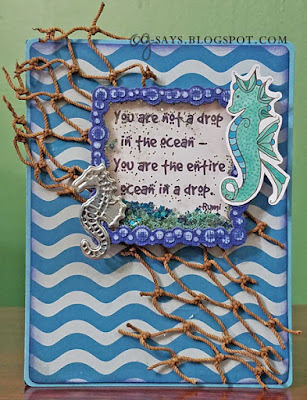 The themes this month at Pile It On are Land Animals and/or Sea/Water Animals. You can choose one or both themes, and you may enter the challenge as many times you like, as long as you are inspired by at least one other Challenge theme. We're sponsored by A Day for Daisies, and I used the lovely Seahorse. I used the font GoodDog for the Rumi quote: "You are not a drop in the ocean. You are the entire ocean in a drop. 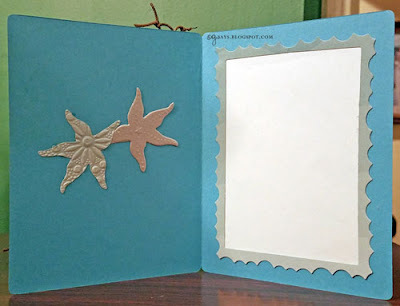 "The frame is a die/embossing set from Cuttlebug. I filled it with blue glitter, confetti stars, and glass beads. I also used some real fishing net. I decorated the inside too. Update: This was chosen as a Top 3 for TSOT #391! Wow, this is a beautiful card! Love your netting element, and your little framed shaker element is simply gorgeous. Lovely colors! Thanks so much for playing at TSOT! love the ocean theme of the card with the rope net in the background. thanks for joining us at TSOT! Beautiful shaker card! Lie it! What a fabulous card - I love the addition of the netting to follow our sketch - and the extra bit of embossing on the inside of the card is a real wow - thanks for joining us at TSOT this week. Lovely card with a great sentiment. Looks great! Thanks for joining us over at the Paper shelter this week. Oh wow! This is so beautiful . My whole house is decorated with beach things since I live three blocks from the Chesapeake Bay . This makes my heart sing . Thank you for joining us at Do Al(l) Kreatives challange. DT Ella.